This is a delicious twist on a traditional recipe. 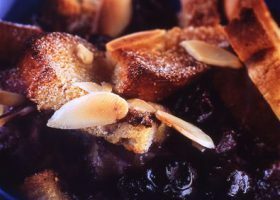 The blueberries add a sharp contrast to the sweet bread and also give the pudding a delicious colour. Place bread on a baking tray and drizzle with melted butter- cook for 10 minutes until lightly browned. Beat together the eggs, milk, vanilla and sugar. Place the bread in a lightly greased shallow ovenproof dish with the blueberries and pour over the egg mixture. Sprinkle with flaked almonds and remaining sugar and allow to stand for about 30 minutes so the egg mixture will soak into the bread. Bake for about 40 minutes until golden brown and lightly set. Serve hot with Greek yoghurt.